Discussion in 'Gambling and Betting Forum' started by JimGunn, Nov 26, 2018. JDS -139 at betonline vs Tuivasa. Can't resist that. Huge step up in competition for Tuivasa. Bet it to win 4 units. Really tempted on Mark Hunt at +100 vs Justin Willis, especially if Hunt is healthy and not infected with staph like it appeared in his last fight vs Oleinik. 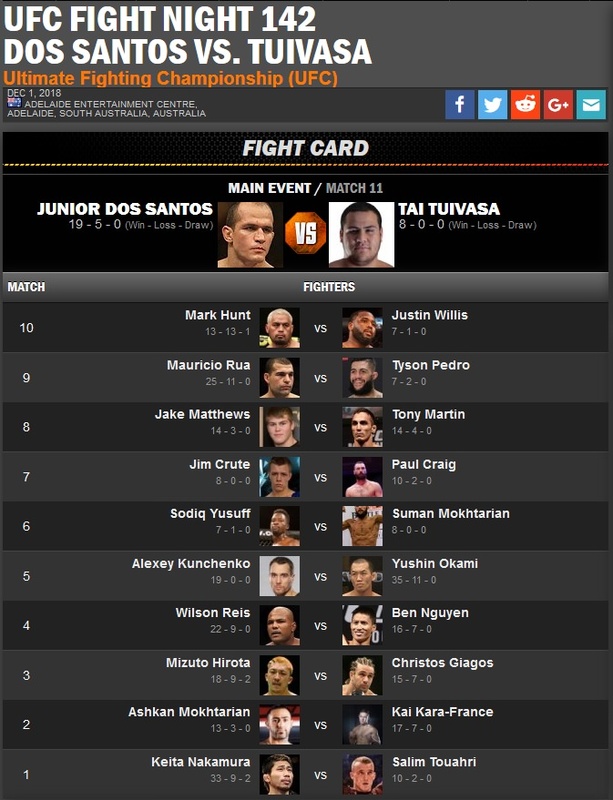 Alright, I'm not waiting any longer: 2u on Hunto at evens. Willis' best win is Chase Sherman and it was only a decision victory. I'll take a chance on The Super Samoan Down Under even at 44 years old. Mark Hunts last fight on contract. Make of that what you will. I will never lose money betting on Mark Hunt again. That train is over for me. UFN 142 Adelaide face-offs: Bear Jew looks huge compared to Jim Crute. Ben had nothing for Reis and I was foolish for thinking so. Looking for live plays on Shogun and JDS after rd 1. Great fight (Matthew Martin). This is the fight I was the most excited about. I think both of these guys have top 5 potential. Mother f*cker, I tried to bet Shogun +450 and +500 after round 1 and it would not go through four times. I hit Shogun KO +825 and Shogun round 3 at +3300, so I hate to complain but that was $200 x +500 or another thousand I missed out on.